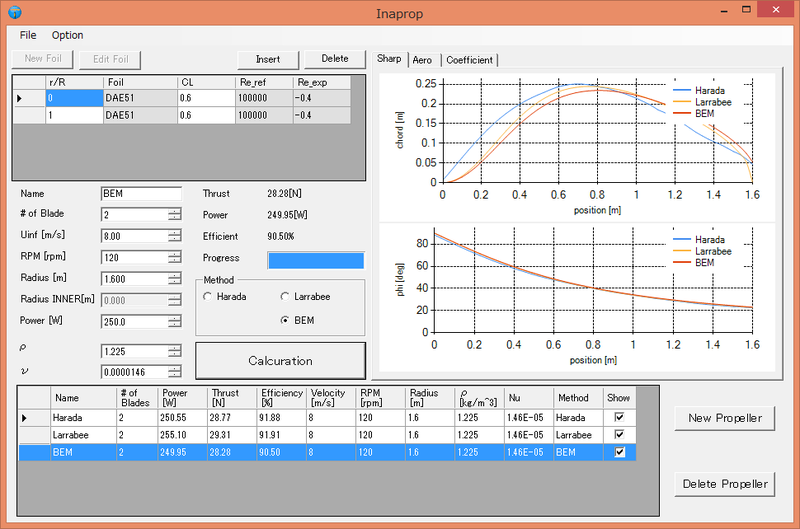 Inaprop is free software for the design and analysis of Low Reynolds number free-tip propellers. Inaprop has three design methods which are Vortex methos, Larrabee method and Adkins Liebeck method(BEM:Blade Element Momentum method). Analysis routine is not implementation yet. Inaprop function is not enough yet.And there is an excellent rotor desing and analysis software 'XROTOR', please use there. Larrabee, E. E., Practical design of minimum induced loss propellers, SAE Technical Paper 790585, 1979 Scribd. Adkins, C. N., Liebeck, R. H., Design of optimum propellers, Journal of Propulsion and Power, vol. 10 (1994), no. 5, pp 676–682. Betz, A. with Appendix by L. Prandtl, Schraubenpropeller mit Geringstem Energieverlust, Göttinger Nachrichten, Göttingen, 1919, pp 193–217. Goldstein, S., On the vortex theory of screw propellers, Proc R Soc London A, 1929, 123, pp. 440–465. Below are alternatives to Inaprop and my recommendated open-source products. PROP_DESING is a aircraft propeller design software. They improve DFDC and XROTOR. Copyright (c) 2013 Inagawa Takahiro Inaprop is Licensed under MIT License. You may copy, modify and redistribute Inaprop or its modifications freely. The code has been developped exclusively for design propeller in low Reinolds number region. All other usages are strongly disapproved. Inaprop is released free, without any guarantee of any kind. Design of all products with the use of the code will be at the user's entire risk Inaprop is by no means a professional product, and does not offer the same gurantees of robustness, reliability, precision or product support than commercial softwares.